Shop Degree Men Clinical Antiperspirant Deodorant Sport Strength (1.7 oz. )1.7 oz. $999$9 and 99 cents$5.88 / oz. Shop Degree Women Clinical Antiperspirant Deodorant Cream Summer Strength (1.7 oz. )1.7 oz. Perspiration occurs throughout the day, often during periods of intense physical activity and even when anxiety strikes. Some people tend to perspire more than others, calling for the ultimate choice in sweat protection. Degree Clinical Strength Deodorant offers men and women a new line of antiperspirants featuring products that react in response to your body movement while providing protection that is three-times stronger than the average deodorant product. Few things are more embarrassing than the wet spots that can appear under your armpits when you're nervous or overheated. With Clinical Protection by Degree, you'll be able to focus on the job interview, your presentation, or asking out that cute guy without worrying about perspiration problems. The products in this line deliver impressive results to people at work and at play, no matter what the weather. Consider Sport Strength and MotionSense products for really active days or the Summer Strength line for the hottest months of the year and vacations in sultry climates. Choose the Degree Clinical Strength Deodorant product that fits your lifestyle best and know you'll stay comfortable and free of unsightly perspiration marks on your clothing regardless of what the day ahead has in store. The Degree brand recognizes that some workouts require more sweat protection power than others, so the company introduced its MOTIONSENSE" Technology to tackle varying levels of perspiration in a big way. The motion-activated technology behind this antiperspirant allows it to increase its sweat defense in line with your body's movement. Simply put, the more you move, the harder your deodorant works to keep you dry and smelling great! But don't be fooled--Degree Clinical Strength Deodorant works hard even while you sleep, giving 24-hour odor protection that keeps you smelling great even after you get your eight hours of rest. 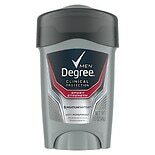 Degree is dedicated to keeping customers comfortable and dry with its Clinical Strength line of antiperspirants and deodorants for men and women. In addition to providing prescription strength wetness protection, the Degree Clinical Strength Deodorant line gives customers a wide array of choices to suit their preferences in fragrance, like Shower Clean, Fresh Energy, and Extreme Fresh. 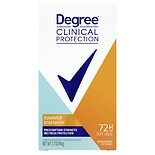 Degree Clinical Protection adds a bonus of skin moisturizing ingredients to soothe the skin and keep it soft and smooth. Even though these deodorants are built tough for the ultimate wetness and odor protection, they are gentle enough on the skin for everyday use.